This is an ancient power food and/or "super grain". It's a great source of protein and it is a healthy gluten-free carbohydrate, so it will give you energy. Tomatoes are great for your skin in particular because they contain a lot of vitamin C and they are packed with powerful antioxidants to help keep your body healthy. They also contain a lot of vitamin A and K which are also good for your eyes and hair. I sometimes just slice up a tomato if I want something healthy to snack on. A really healthy fat containing a lot of vitamin E, which is great for your skin and hair. 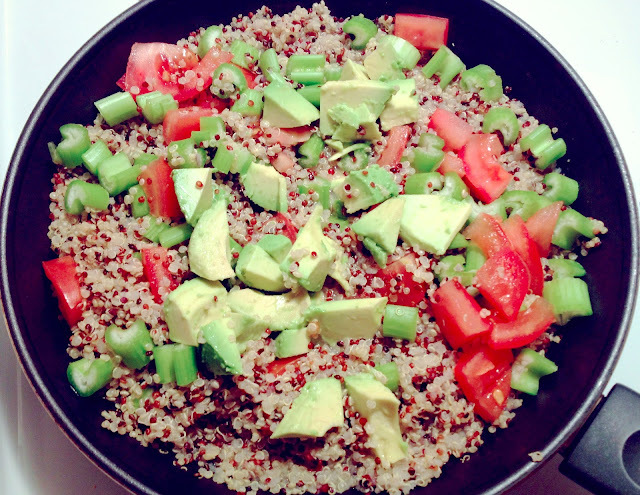 I love the crunchiness of celery, especially combined with softer foods like avocado and tomato. Celery is great for reducing inflammation and water weight in the body. It also has a lot of antioxidants and is rich in fiber. And you can of course add chicken or turkey breast for extra protein and/or any other veggie you'd like, such as cucumber, bell peppers, sweet potato etc. I always make a little extra to keep for the next couple of days. This requires minimal effort :) so it's a super easy dish to whip together if you want something healthy to eat or just to snack on. Looks so good! Definitely going to try this one :) Thanks! I really love these posts, I'm going food shopping this morning so may make this for my lunch! Looks absolutely gorgeous. I love the fresh feeling I get after eating a really healthy meal! Your dinner looks so colorful. You inspire me to eat healthy. Thanks for sharing what you eat. I had almost the exact same dinner today! 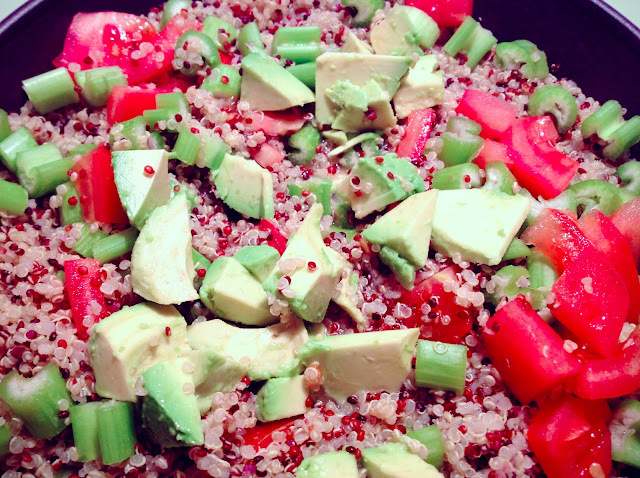 Whats the red seed looking stuff in between the quinoa? Could you write your diet?I mean what you eat now because you've eliminated dairy&wheat from your diet...I am trying to do this too but I don't really have ideas for what to eat on breakfast and I always go back to yogurt and cereal.And I'd like to see more posts with food on your blog:) You're doing such a great job! I really appreciate your will on having such a healthy life and your a great beauty guru too with sophisticated sense of style!